Shoju-in Temple (Shojuin) is an hour’s bus ride away from JR Uji Station, and the temple is in Ujitawara, an area famous for producing quality tea. The temple has been getting more and more popular on Instagram and Twitter lately among young Japanese women. Shoju-in is said to have been first built around 800 years ago, so even though the temple is small, it has a very long history behind it. In the main hall the temple treasures their main Buddhist statue, an 11-faced statue of Kannon Bosatsu which is only shown to the public once every 50 years. The reason for this temple’s popularity among the young women of Japan is in their heart-shaped Inome-window which is said to bring in happiness, and in the 160 ceiling paintings of the temple. Together these two things make this place one of the most photogenic temples in Kyoto. Every year from July 1 to September 18 you can see and hear the Furin Matsuri wind chime festival at the temple with 2,000 wind chimes. In this area, the summer temperature is usually around 5 degrees Celsius lower than in downtown, so this event is a great way to enjoy a cooler summer in Kyoto. The heart-shaped inome-window is located in the guest room of the temple, and the inome-shape is actually a traditional Japanese symbol which comes from the shape of wild boar’s eyes. The inome-window of Shoju-in shows you a different view depending on the season; in spring, you get to see the pink cherry blossoms; in summer, you get to see the green leaves; in autumn, you get to see the colorful autumn leaves; and in winter you get to see the snowy scenery. 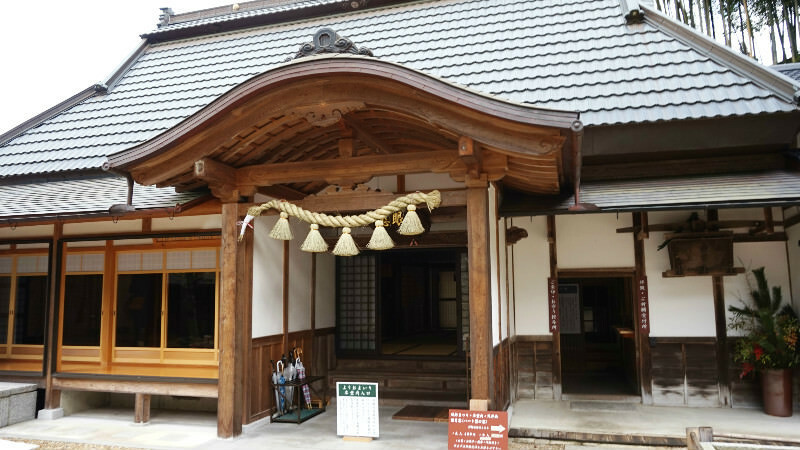 Although the main Buddhist statue of the temple, the 11-faced Kannon Bosatsu, is only shown to the public once every 50 years, you can pray while holding a string which is connected with the statue that is located on the other side of the door. If you look up in the guest room you will get to see 160 ceiling paintings. You can see all kinds of beautiful paintings, with pictures of flowers and Japanese scenery, but some of them also have such motifs as Raijin and Fujin, the gods of wind and thunder, and even maiko (apprentice geisha). In the main hall you can see a ceiling painting which was painted 250 years ago, so comparing the paintings should also be a nice pastime while at the temple. Every year from July 1 to September 18 you can see and hear the Furin Matsuri, a wind chime festival at the temple with 2,000 wind chimes. These delightful chimes bring a respite from the hot summers of Kyoto. You can even experience painting a wind chime at the festival for 1,000 yen. If you use public transport, you can take a Keihan bus from either JR Uji, Keihan Uji, or Kintetsu Shin-Tanabe station, and then change to a local community bus. The trip will take around an hour, and there’s usually only one bus per hour, and you need to note that the community bus gives priority to local people so there is a possibility that you may not be able to take it. Shoju-in Temple in Uji is famous for its heart-shaped window, and many people come to this temple especially to see it. The temple is even cuter if you take a picture of it and the cute ceiling paintings together! And the summer festival of wind chimes is definitely a cool thing to see. Although it’s not easy to get to this temple, it’s still worth the trip. Take Keihan Uji Bus (180, 182, or 184) from JR Uji, Keihan Uji, or Kintetsu Shin-Tanabe Station, and then after riding the bus for around 30 minutes get off at Ichu-mae bus stop. From Ichumae bus stop take the community bus stop to Oku-Yamada bus stop. The bus ride is around 10 minutes, and so is the walk to the temple from Oku-Yamada bus stop. From April to October: 8:30 a.m.-4:30 p.m. November to March: 8:30 a.m.-4:00 p.m. Entrance fee is 400 yen and includes tea and a Japanese sweet. Going to this temple by taking a bus might be a bit hard for first timers, for whom we recommend taking a taxi.